Brain development in Homo erectus is a subject of great interest, and the infant calvaria from Mojokerto, Indonesia, has featured prominently in these debates. Some researchers have suggested that the pattern of brain development in H. erectus resembled that of non-human apes, while others argue for a more human-like growth pattern. 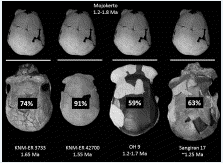 In this study, we retested hypotheses regarding brain ontogeny in H. erectus using new methods (resampling), and data from additional H. erectus crania. Our results reveal that humans achieve 62% (±10%) and chimpanzees 80% (±9%) of their adult endocranial volume by 0.5–1.5 years of age. Using brain mass data, humans achieve on average 65% and chimpanzees 81% of adult size by 0.5–1.5 years. When compared with adult H. erectus crania (n = 9) from Indonesian sites greater than 1.2 million years old, Mojokerto had reached ∼70% of its adult cranial capacity. Mojokerto thus falls almost directly between the average growth in humans and chimpanzees, and well within the range of both. We therefore suggest that brain development in H. erectus cannot be dichotomized as either ape-like or human-like; it was H. erectus-like. These data indicate that H. erectus may have had a unique developmental pattern that should be considered as an important step along the continuum of brain ontogeny between apes and humans. Figure 1. The percentage of adult endocranial volume achieved by Mojokerto when compared with four different adult Homo erectus crania. Homo erectus is spatiotemporally quite variable, and the choice of a reference sample greatly influences whether the Mojokerto specimen is growing more like a chimpanzee (higher PEV values) or more like a human (lower PEV values). Figure 2. The number of individuals per PEV and PBM is graphed for humans, chimpanzees, and the two brain estimates for Mojokerto relative to all adult Homo erectus crania (n = 22) greater than ∼1 million years. Notice that there is considerable overlap between the right tail of the human distribution and the left tail of the chimpanzee distribution. The two Mojokerto estimates fall between the distributions, and could be sampled from either humans or chimpanzees.